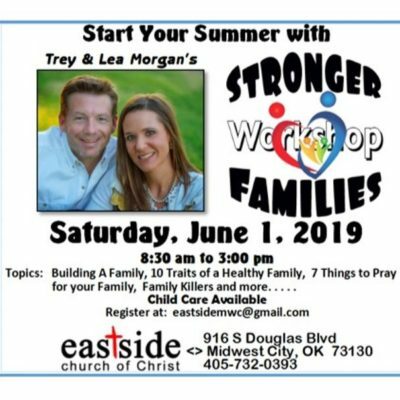 You are invited to attend the Stronger Families Workshop on Saturday, June 1, from 8:30 to 3:00 at East side Church of Christ in Midwest City. The Workshop is free. Breakfast snacks will be available. Lunch will be on your own. Child care can be arranged. Please register, especially if you need child care. Hope some of your families will be interested in this learning experience.